We've had an intrinsic hand strengthening play dough mat on the website for a long time. It's been one of our biggest free downloads ever since it was uploaded! There is a reason why: Kids need to strengthen fine motor skills, badly! It seems like there are more and more students who struggle with the necessary fine motor skills needed for a functional pencil grasp and other skills. They need hand strength! Strengthens the intrinsic muscles for improved endurance in fine motor tasks such as maintaining hold on a pencil, manipulating clothing fasteners, managing and using scissors, coloring, and many other tasks. Because the simple play dough mat offered on this site has been such a need and so successful, We wanted to share a few other play dough mats that can also be used to encourage and develop these fine motor skills. Over the next few weeks, you will find even more themed play dough mats coming your way. Today we've got an Astronaut themed play mat. This mat is nice for incorporating into a space theme or for any child that just loves all things space! For this play dough mat, you can ask children to pull off a small piece of play dough and roll it in their hand using only the fingers and thumb of one hand. To encourage intrinsic hand strength, dexterity, coordination, and endurance of the intrinsics, it's important to use just that one hand. It's part of the challenge! Other uses for the play mat can include rolling the playdough with the palms of two hands. That's a great activity too and fits perfectly with many children's fine motor needs. 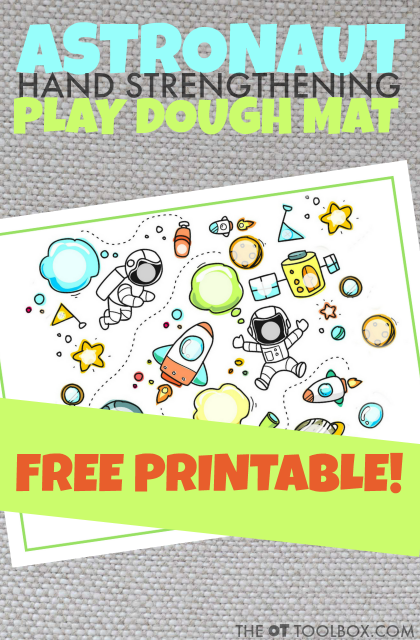 Want to print off this astronaut play dough mat? Enter your email in the form below. You'll receive an email with a link to access the file. Want to strengthen the muscles in the hand to improve pencil grasp, scissor use, coloring, or fine motor coordination and endurance? 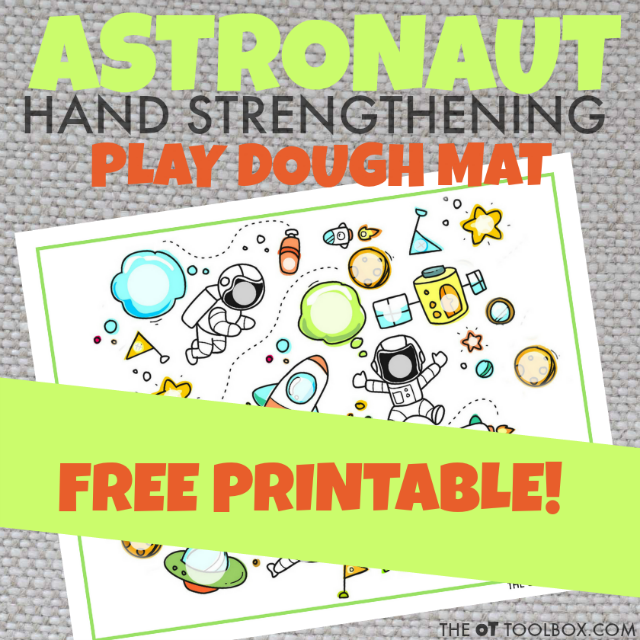 Grab this FREE printable Astronaut themed play dough mat to help kids strengthen the intrinsic muscles of the hands! You'll also receive weekly emails that are loaded with resources and tools promoting the healthy development of kids. I NEED the free printable play mat! To use this play dough mat over and over again, add a layer of reusability by laminating the paper or slipping it into a sheet protector sleeve. There are different sizes of circles on the mat all with an astronaut theme. Each sized circle , requires the child to roll small or large play dough balls. This encourages more refined intrinsic muscle use and improved dexterity of the hands. 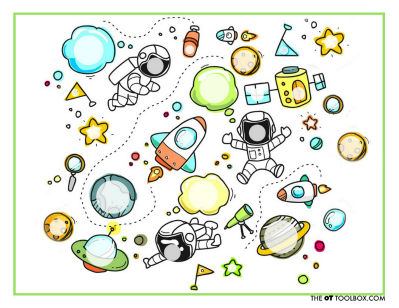 Once you access the astronaut play dough mat, you'll also receive access to an additional 5 themed play dough mats that will be coming to the site in the next few weeks. These themes include planets, toys, ice cream, city and birds. Each play dough mat will be available in our subscriber library once they are up on the site. Stay tuned! Need more hand strength ideas?